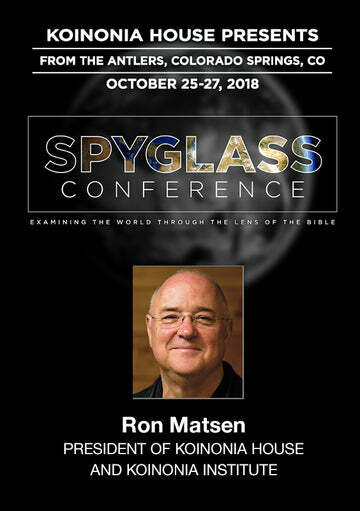 Imagine traveling to Israel and not only seeing the traditional Biblical sites and enjoying Bible studies with a great Bible teacher, but also visiting military bases, meeting IDF soldiers on Israel’s front-line of defense, and hearing from some of the top experts in Israel, who can give you a clear under-standing of what is really going on inside Israel today. Strategic Perspectives – Israel: Israel from the Inside reveals the sights and insights experienced during the Koinonia Institute’s Issachar Tour in November 2009. This six-session DVD set begins with a 50-minute video collage entitled “Insight from the Inside,” which portrays the essence of what it is like to be on an Issachar Tour with Dr. Chuck Missler. To be honest, this was both the most difficult and the most rewarding piece we assembled for this series. We had to take 10 days of touring, 30 hours of filming, and countless experiences and compress them into a 50-minute video and somehow preserve the content, context and emotions we all felt during this incredible experience without turning it into another “vacation video” that nobody would really want to view again. WARNING: after seeing this first session, you may be tempted to immediately register for the next Koinonia Institute Issachar Tour. During five of the evenings on the tour, we were treated to intimate insider briefings. Each of these sessions offered a unique perspective from inside Israel. Avner Talmon, Lt Colonel (Res) with the IDF Paratroopers, gave an insightful presentation where he told the tour members what it is like “Living on the Golan.” His humorous delivery about his family and business challenges while living on the Golan Heights gave the group a feeling of the difficulties facing the Israeli citizens living on this disputed area northeast of the Sea of Galilee. For us, he typified the attitude of many who find themselves in this same situation in Israel where they are literally smiling in the face of constant danger. 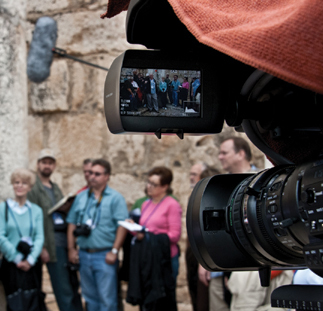 Dr. Chuck Missler, Founder of the Koinonia Institute, laid the foundation for the Issachar Tour by explaining, “Why Israel?” Dr. Missler gave the Biblical basis for why Koinonia Institute takes tour groups such as this to Israel. He explored how the nations of the world are challenging God’s promises to Israel. He explained why every Christian should be interested in events involving Israel and why “visiting the Land” was one of the best ways to understand Israel; past, present, and future. Amir Tsarfati, Captain in the Israel Defense Force, power-fully answered the question, “Will Israel Stand Alone?” Isolated like no other nation on earth, Israel faces some incredibly difficult challenges as it tries to defend its national borders and protect its citizens. His impassioned presentation left everyone speechless as we considered both the dilemma and destiny of Israel today. 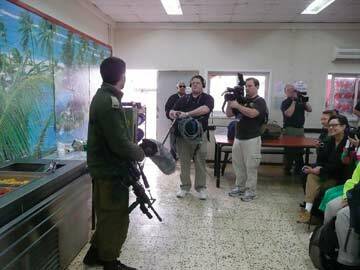 Itamar Marcus, Director of Palestinian Media Watch, revealed the shocking truth of “Palestinian Society through Media” by utilizing actual video clips from programs shown daily on Palestinian television. This is a session that will both inform and infuriate the viewer as Mr. Marcus exposed the truth about what the so-called Palestinians are really saying to each other through their media. The brazen lies that are sown into the minds of those who feed on this type of misinformation is truly shocking, as the producers of these programs flaunt their unbridled hatred for Israel and their disdain for all non-Muslim societies. MK Moshe Ya’alon, Vice-Prime Minister of Israel, presented our final session by revealing the “Challenges Facing Israel Today.” As a member of the Israeli Knesset, Moshe Ya’alon stands in a place of incredible insight and influence as he is second in command to the current Prime Minister, Benjamin Netanyahu. MK Ya’alon spoke from the heart as he emphasized Israel’s right to exist. He revealed the difficulty in international diplomacy that Israel faces as it tries to negotiate for peace with its neighbors while still preserving the ability of Israel to protect its citizens. He emphasized the cur-rent Israeli government’s commitment to not trade land for peace. All in all, this was truly a “trip of a lifetime” for many who went on this tour, but that does not mean that only a few can enjoy its discoveries and delights. This unique offering of Strategic Perspectives – Israel will enlighten you, excite you and most of all remind you of the importance of Israel in the present-day prophetic landscape. Remember, “Pray for the peace of Jerusalem: they shall prosper that love thee” (Psalm 122:6). The Koinonia film/production crew was often referred to as the Matsenim as it was comprised of Ron, Ben, John and Matt Matsen, who are all from the Koinonia House Europe office.